Pay just $49 for a 5 1/2 hour Hoover Dam tour that includes round trip transportation from your hotel in Las Vegas. Click on your friend Coupon Puppet below to buy your Hoover Dam Tour discount tickets. We simply couldn’t believe the price of these Hoover Dam Tour discount tickets! For just $49.99, you will be picked up at your hotel at 9:00AM. Enjoy the free bottled water as you ride in air conditioned comfort to the world famous Hoover Dam. Along the way you’ll get some great views of Lake Mead. Once you arrive at the Dam, you’ll have two full hours to explore before hopping back on the bus and arriving back at your hotel approximately five and a half hours after your departure. What is super clutch about this particular tour is that the Hoover Dam generator room tour IS INCLUDED. You will not pay a penny more for this premium. If you decide two hours simply isn’t enough time to scrutinize this amazing example of American ingenuity, there are plenty of other Hoover Dam tour discount tickets to choose from. How about a deluxe tour including lunch at the High Scaler Cafe at the Dam? Or maybe an optional Lake Mead cruise add-on? There is even a comedic “Hoot and Hoover Dam” tour for $99. Being stuck in a bus with a comedian for six hours straight sounds like the stuff of nightmares to Coupon Puppet. But this tour is rated a unanimous 5 Stars! So if you like to laugh (continuously, for six hours) then maybe you should consider it! 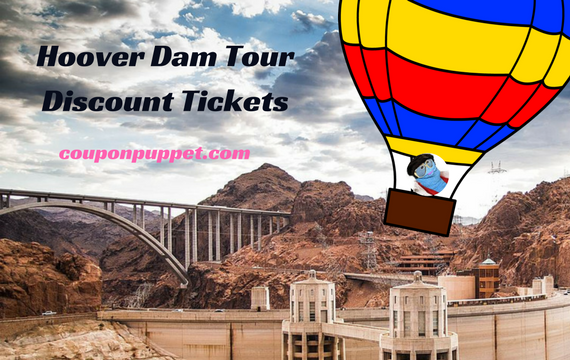 Coupon Puppet Loves Saving You Money On Hoover Dam Tour Discount Tickets!